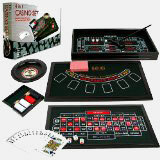 Turn your Living Room into a Las Vegas Casino with this five-games-in-one in a sophisticated wooden traveling case. Blackjack, Baccarat, Texas Hold 'Em Poker, Craps, and Roulette are all here, with generously sized felt table layouts, and high quality poker chips, dice, and accessories. Everything in this set is real, full size casino equipment: a solid wood and steel roulette wheel, genuine Bee playing cards, real casino poker chips, and yard-long felt table layouts that are close to the size you'd expect in a real casino. Don't confuse this set with one of those cheap, all-in-one game set with tiny or disposable pieces; we give you the real McCoy.